Of the many British Invasion acts that stormed the charts in the wake of the Beatles, Chad & Jeremy possessed a subtlety and sophistication unmatched among their contemporaries, essentially creating the template for the kind of lush, sensitive folk-pop embraced by followers from Nick Drake to Belle & Sebastian. Chad Stuart (born in Windemere, England, on December 10, 1941) and Jeremy Clyde (born March 22, 1941, in Buckinghamshire, England) met while attending London's Central School of Speech and Drama. The two became fast friends, and after Stuart taught Clyde to play guitar, they formed a folk duo as well as a rock & roll group, the Jerks. Because he graduated a year ahead of his bandmates, Clyde relocated to Scotland and performed with the Dundee Repertory Theatre. When the Jerks dissolved, Stuart dropped out of school, studied arranging, and wrote songs with composer Russell Franks. Clyde returned to London soon after, but in the face of an actors' strike, he resumed his music career, reunited with Stuart, and the duo landed a residency at the local coffeehouse, Tina's. Chad & Jeremy quickly earned a fan following, and in mid-1963 composer and producer John Berry signed the duo to the small independent label Ember Records. They released their debut single, "Yesterday's Gone," that autumn and it entered the U.K. Top 40. Remarkably, it would prove their only British hit of any real substance. Around 1967, the duo had almost completely split up, save for recording dates. Jeremy featured in Black Comedy, as well as doing an episode of "My Three Sons" during this period. Unfortunately, he occasionally missed concerts because of acting conflicts and tensions between the two began to mount. 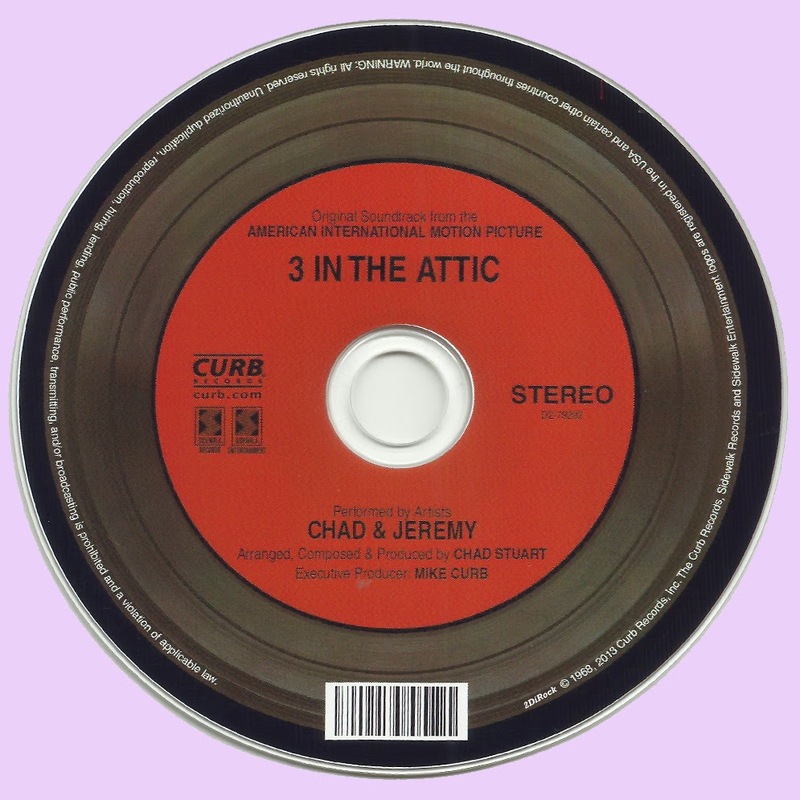 During this period, Chad was approached to write the score for an American International Picture, entitled Three In The Attic. Bob Irwin once described it as "a very sixties movie", and today Chad squirms at the very mention of the film, the only explanation for his involvement being that, "I was so hungry to score a picture, that I deliberately clouded my judgement, and ignored that little voice inside me". Certainly thirty years later, the soundtrack is still wonderful. A million thanks to you, dear Marios. I requested this one a couple of weeks ago. I am speechless. Don't know what to say, really. Thank you ever so much for this jewel dear Mario.